Snowden says NO to Allo, take a trip with Google, Tinder and Spotify want to know your anthem, build a LEGO drone, and self lacing kicks are real. Please keep your arms and legs inside the ride at all times and hold on tight for some Weekly Wins. Sit back, put your feet up, sip your favourite Friday bevy, and let the Weekly Wins gently take you into the weekend. This week saw the initial release of Allo, Google’s very own messaging system. Functioning a lot like your typical messaging apps like iMessage or Whatsapp, Allo allows mobile users to engage in text conversations. Also, like many other messaging systems, Allo let’s you send images and gifs as well as engage in group conversations. Nothing groundbreaking here, right? Hold up a minute (insert record scratch SFX). Allo’s breakthrough tech is actually the implementation of Google Assistant, a bot that watches your private conversations and makes suggestions based on what you’re talking about. So if you’re cool with that, then Allo is definitely the messaging app for you, but I know of at least one person who’s not into the idea. Google Assistant – helpful or harmful? Your call. On one hand, Google released a messaging app that listens to your conversations, on the other, they may have changed traveling for the better. 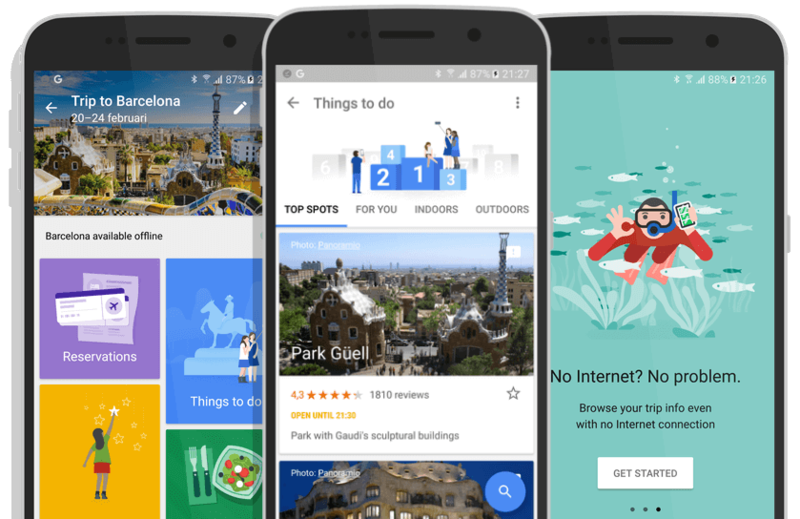 Google Trips is an offline travel app that can automatically scrape your Gmail and Inbox for plane tickets and reservations to create offline, quick-access itineraries. Heading out of town for a couple of nights? Google Trips can suggest everything from half day trips around a city, to finding the best bagel within walking distance. And all of the suggestions are based on your recent searches and locations. My, we’ve come a long way since Frommers and gas station folding maps. Tinder and Spotify have joined forces for the good of hooking up. Users can now connect their Spotify accounts to their Tinder accounts and share their playlists to let all of their potential hookups know what kind of music they’re into. For some people, a similar taste in music is a strong sign of connection and Tinder has leaned into this notion hard with Anthems, a new feature that allows everyone to share a personal theme song. I would imagine a lot of Tinder users already share their taste in music on their profiles so the creation of Anthems and the team-up with Spotify was really just a matter of time. 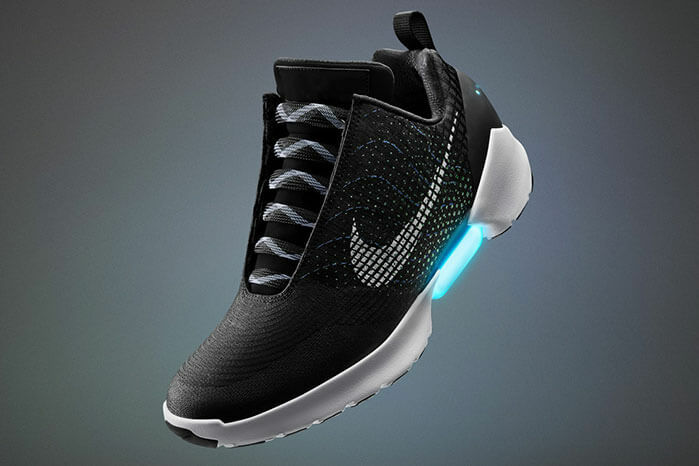 Based on the extreme fandom from both sneakerheads and Back to the Future fans, it really was only a matter of time before Nike leaned into the idea of mass producing some self-lacing shoes. Well, it’s been about 27 years since Mary McFly stepped out the DeLorean, threw on a lifejacket-looking vest and stepped into a pair self-lacing Nike Mags. Since then, there have been rumours, and even prototypes created for charity, but not until this week has self-lacing shoes become a reality for everyone. This week Nike revealed the HyperAdapt 1.0, the first self-lacing shoe to be made public for all. The HyperAdapt 1.0 isn’t exactly what fans will remember from the movies, but the technology from the Back to the Future franchise was definitely a major source of inspiration. Next up? Hover-board please! LEGO helps us built fantasy worlds, construct imaginative structures, and reminds us all that everything is in fact awesome. But there’s one place that LEGO hasn’t conquered yet, and that’s the skies. Until now. Thanks to a company called Flybrix, LEGO fans everywhere can now purchase a kit to build their very own LEGO drones. There are three different Flybrix kits to choose from – one allows you to control your LEGO drone with your smartphone, while the other two come with remote controls. It’s probably important to note that Flybrix doesn’t have an official relationship with LEGO, but isn’t that the point? To inspire creation? Happy droning kids!